Polly is a nickname for Sarah, if I am not mistaken. hey Israel! I just found this out just last week as I made a connection with this new match, did a quick search and realized it was a nickname for both Sarah and Mary. I saw the names for the people of Pitcairn island (I have their genealogy and some of their descendants did a DNA test) and I have seen Mary Polly together. The ethnicity by chromosome at 23 & Me is neat. At GRIP, we worked with that in one of CeCe’s lectures to solve some adoption cases. It was 23andme’s ethnicity portion that helped me figure out where in the tons of descendants of my 3x great-grandparents my mother’s biological parent lies among all the tons of names I had to choose from. But definitely is useful if you know how to use it to your advantage. 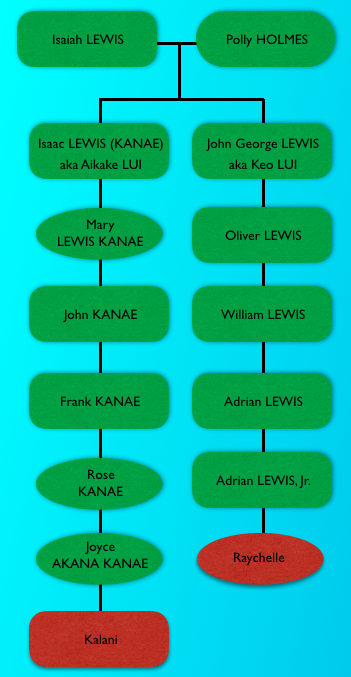 My GGrandmother, Annie K. Lewis, was married to a man. Unknown if he was a Lewis or Jones. Either my GGrandfather or GGGrandfather, (name unknown), sailed on a ship (name of vessel unknown), he became ill, and died. My Grandmother, Sadie Moikauhane Jones and her brother William Kealoha Jones or Thomas William Kealoha (the name maybe Keleialoha). 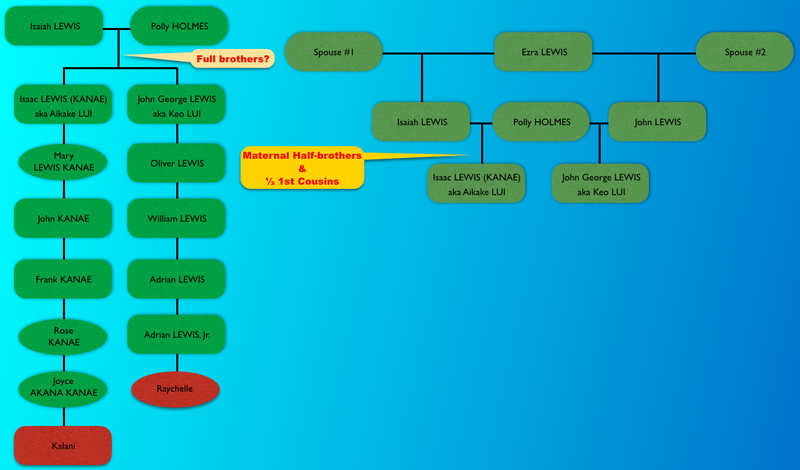 I see in the Lewis tree there is also a Jones. I swear I’ve seen Annie K. Lewis keep popping up. 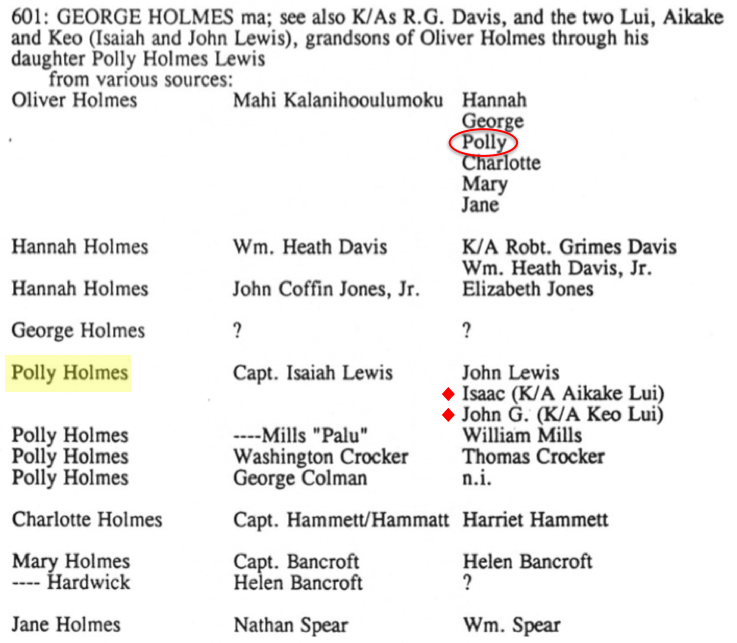 The Jones that we have was Elizabeth Jones, daughter of Hannah Holmes. Not sure if there are descendants as she died at the age of 22.
is there some place you note your Gedmatch number? I’d like to run a one to one match on you. We have a similar family name me Thomas Hobron Krueger—- you Holbron. When I wrote down my notes from my grandma when beginning my genealogy research I wrote Holbron down first, only change it when the records i found dropped the L—- I also found some that dropped the R, so it could be a matter of spelling errors more than anything else. You can run my mother’s kit: T808766 You can find all my relatives by seeing her ONE TO MANY matches. 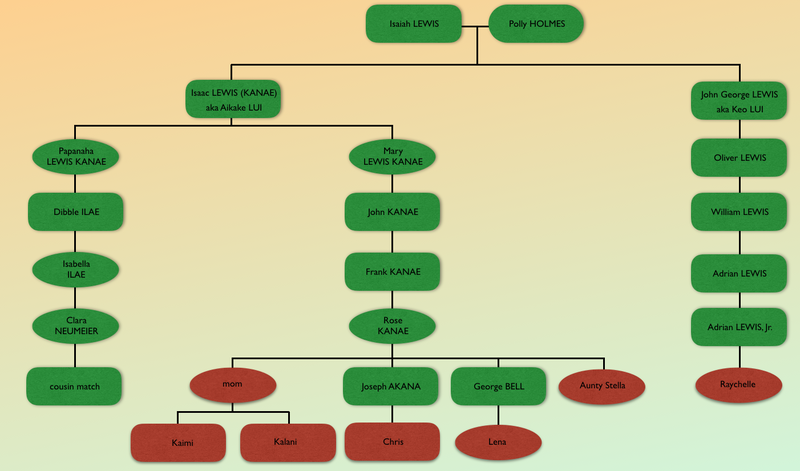 I know there is a Hobron family, and I’m curious now that you mentioned that since I wanted to know if there were any descendants. I assume there was, but still looking. And I don’t show any Thomas Hobron or the Kruegers that I saw in my database doesn’t seem to connect to the Holbrons or Hobron. Unfortunately, no, not a match! It was worth a shot, though. Take care, and thank you for your blog, It’s helping me with figuring out my DNA puzzles—–> figuring out the Hawaiian is a journey! Oh interesting ! For sure! A woman contacted me last night because we were a low match in DNA.land. On the One to One it turns out we aren’t, but we have the same middle name Keahialoa/Keahiloa and to her that means something. So I told her— no matter, we are still kin! In case you or anyone else wants to run it. it’s always interesting to see how some people’s matches don’t show up on my mom’s and vice versa. You have a person I don’t recall seeing on my mom’s. Maybe it is and it’s way down her list. In fact my mom didn’t show up on your ONE TO MANY list immediately but her sister and another person did. So I went to the TOTAL CM column, click on that arrow and then I was able to search for “Kalani” and found my mom, as I do with you on her list. And since you tested with FTNDA, I looked for you in my mom’s matches there, couldn’t find you. You’re probably there, I couldn’t find you by searching your first nor last name. Oh wow, just saw this after find your aunt as match! I will check my FTDNA matches and see. 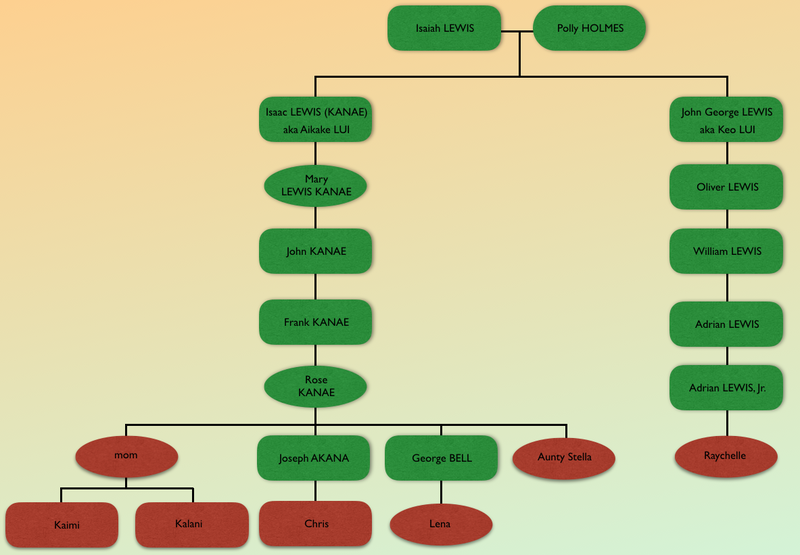 Ok, so just checked FTDNA and Kaimi 1/2 (brother of Kalani Mondoy) came up as a 5th cousin – remote at 35cm longest block 8. Ok, duh.. just skimming through your post again. I think I found a tree connection.